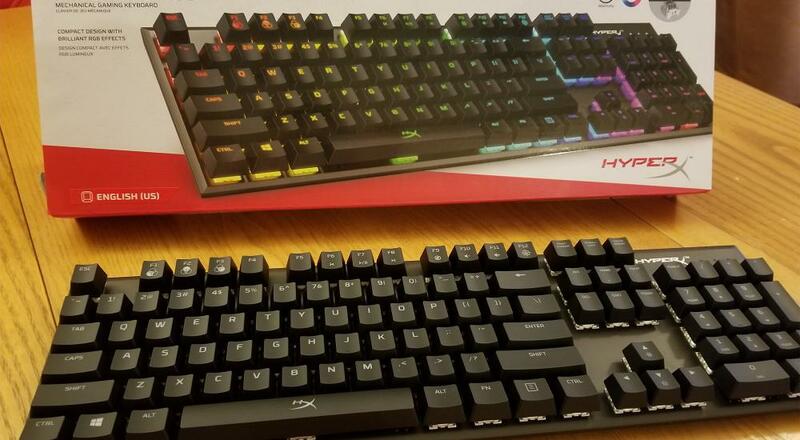 The Alloy FPS RGB looks virtually the same as the original Alloy FPS (the first HyperX keyboard), which is a keyboard that I’ve praised highly in the past for its compact, no-frills, and high performance design. Rather than being fully plug-and-play, though, the Alloy FPS RGB integrates with the HyperX NGenuity software to allow for custom lighting and macro options. On the physical side of things, there has been one major change between the Alloy FPS and Alloy FPS RGB: the switches. Whereas all the previous Alloys have used Cherry MX switches, the Alloy FPS RGB uses Kailh switches. Kailh is another switch producer and while there exist Kailh Reds, Blues, and Browns which are similar to Cherry’s famous versions, here HyperX has made use of a Kailh Speed switch - specifically Silver. Speed switches (which Cherry also manufactures) have shorter travel and faster actuation distances, making them even more appealing to many gamers. A Silver Speed switch is a light linear switch, like a Cherry Red, but theoretically a smidge faster in response due to its shorter switch length. On the function side of things, there’s a whole lot more going on with the Alloy FPS RGB compared to its original recipe sibling. 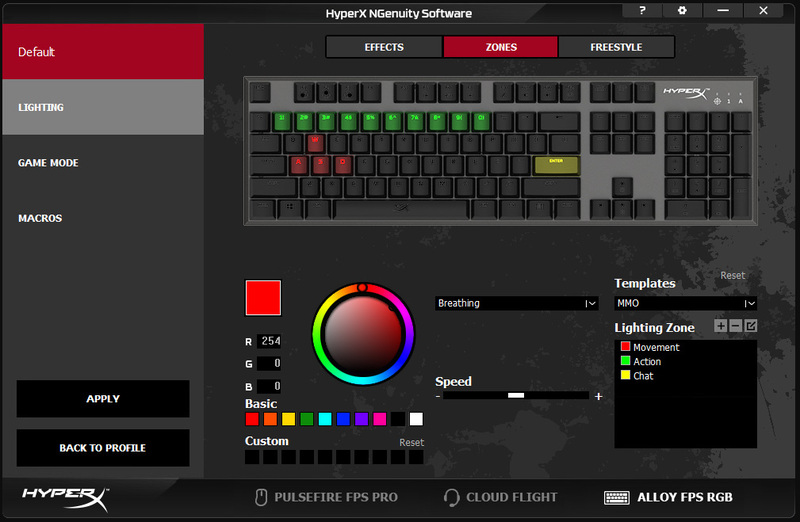 Using the NGenuity software, up to three individual profiles can be saved directly on the keyboard, each with their own lighting, game mode, and macro settings. There are seven different lighting effects to choose from (solid, breathing, wave, trigger, explosion, HyperX flame, and cycle), each of them supporting some combination of a single color, dual colors, random color, or a color spectrum (a cycling rainbow). Any colors that you pick come from a full color wheel and you can set the speed of any effects that have a timing component. 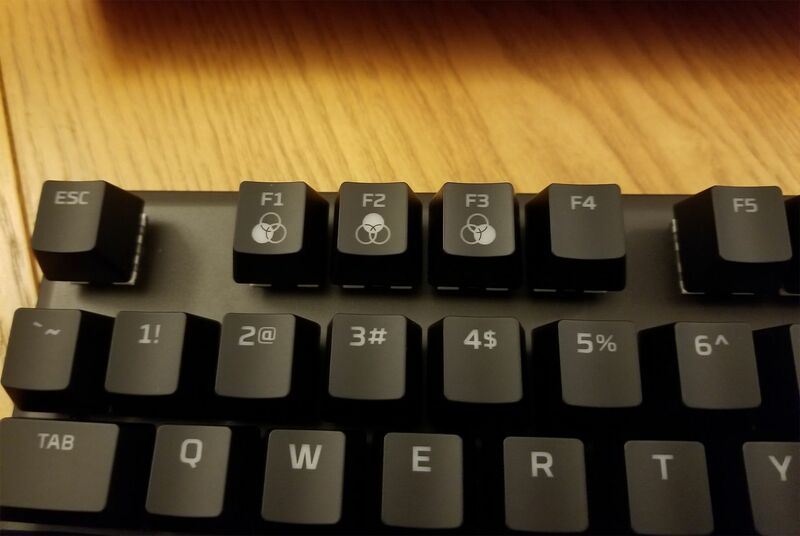 You can divide your keyboards into zones (pre-sets include different colors for groupings of keys popular in genres like MMOs, MOBAs, and FPSs) or even set the color of each individual key if you want. With so many lighting possibilities, everyone should be able to find something to their liking. Page created in 0.6887 seconds.